The Aberdeen IronBirds seek to fill a key Director-level position in its corporate partnerships department. The IronBirds, one of Minor League Baseball's most successful franchises, are owned by Bill Ripken and Cal Ripken, Jr., baseball's Iron Man and a member of the Baseball Hall of Fame. The club plays at gorgeous Leidos Field at Ripken Stadium, located in Cal and Bill's hometown, Aberdeen, Maryland, just twenty-five minutes from downtown Baltimore. THE IRONBIRDS ARE LOOKING FOR A DIRECTOR OF CORPORATE PARTNERSHIPS AND YOU JUST MIGHT BE THE SUPERSTAR THAT FITS THE BILL. The Director, Corporate Partnerships is responsible for producing new corporate partnerships revenue while also overseeing the department's junior salesperson and servicing staff. The Director must set appointments with regional business leaders, an expectation of 7-10 meetings per week is required, to market and sell new corporate partnerships. The Corporate Partnerships Intern is responsible for assisting with all day-to-day activities within the corporate partnerships department. This intern must be highly motivated and eager to assist with all duties related to servicing and executing the contractual details for corporate partners. The candidate must have outstanding relationship and organizational skills and possess strong verbal and written communication skills. A high proficiency in all Microsoft Office programs is required. The Flight Crew, led by ballpark emcee Captain Fun, provides the glitz, glam and show of the game experience at Leidos Field at Ripken Stadium, home to the Aberdeen IronBirds, short season 'Class-A' affiliate of the Baltimore Orioles. The Aberdeen IronBirds, short season 'Class-A' affiliate of the Baltimore Orioles, seek a mascot performer for the upcoming 2019 season. The mascot performer will be responsible for bringing to life the personality of one of the organization's two characters, Ferrous and Ripcord, entertaining fans and helping to drive the best game presentation in Minor League Baseball. 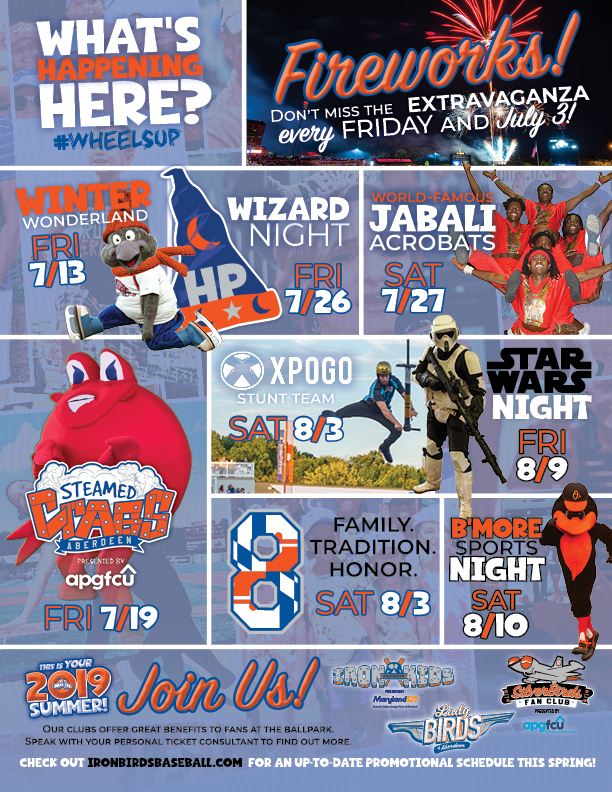 The experience of the Marketing & Social Media intern will focus on showcasing the family fun entertainment that is associated with the IronBirds brand to our targeted demographical areas of Maryland, Washington D.C. and southern Pennsylvania. Marketing & Social Media interns of the Aberdeen IronBirds will acquire a first-hand experience in marketing a Minor League Baseball organization through digital and traditional media efforts. The Aberdeen IronBirds, 'Class-A' affiliate of the Baltimore Orioles and part of the Ripken Baseball family, seek a Production Intern for the 2019 baseball season. Position would being in effect from May to August, maximum 20 hours per week. Under the general supervision of the Catering Manager, bartenders provide positively outrageous guest service to patrons at the suite level bar and other bar locations during all events at the facility. They will assist with suite bar set-up, inventory management, and suite bar cleanup at the conclusion of the event. As one of the front-line guest service employees, suite bartenders must be professional, helpful, and enthusiastic to excel at this job. Under the general supervision of the purchasing manager the beer runner is responsible for stocking product to each location during the events. Under the general supervision of the Floor Supervisor and Cash Room Clerk, the Beer Server is responsible for taking and fulfilling guest orders, including the receipt and disbursement of money or legal tender (credit cards, debit cards, gift cards, team cash, coupons or comp cash) during game day at the facility using cash registers. Under the general supervision of the stand manager and cash manager, the cashier is responsible for taking guest orders, including the receipt and disbursement of money or legal tender (credit cards, debit cards, gift cards, team cash, coupons or comp cash) during game day of concession stands, or portables at the facility using cash registers. Under the general supervision of the Concessions Manager and Director of Food Service, the Cash Manager is responsible for delivering, auditing and picking up of all cash register drawers. They also provide change when necessary. Cash managers also help train and enforce proper cash handling procedures for the cashiers. Under the general supervision of the Premium Manager, a Picnic Server provides positively outrageous guest service to all guests at each facility's picnic locations. They will assist with picnic set-up, serving, cleanup and prepare for next day event(s). As one of the front-line guest service employees, a Picnic Server must be professional, helpful, and enthusiastic to excel at this job. Under the general supervision of the shift lead and concession manager, the concession cook is responsible for preparing food and assisting in the preparation of items during the event. The cook should understand the proper cooking and holding procedures to not sacrifice quality or freshness of product. The concessions bartender will be responsible for serving beer to guests, keeping in mind they must be of legal drinking age and not intoxicated, with exceptional customer service. Under the general supervision of the shift lead, concession manager, and executive chef the concession cook is responsible for preparing food and assisting in the preparation of items during the event. The cook should understand the proper cooking and holding procedures to not sacrifice quality or freshness of product. The concessions stand worker will be responsible for taking guests' food orders, preparing/wrapping food items and dispensing beverages with exceptional customer service. The concessions stand worker will also be responsible for cleaning and maintaining service areas, including restocking of necessary items. Under the general supervision of the purchasing manager, the warehouse staff is responsible for stocking each location based off of predetermined needs list. Also, the staff is responsible for receiving all food deliveries and storing them in the correct locations. Under the general supervision of the Kitchen Manager or Kitchen Supervisor, dishwashers provide positively outrageous guest service to patrons at all locations by ensuring all dishes and utensils are clean and safe for all events at the facility. They will assist the kitchen staff to ensure the kitchen meets all standards set by both PSC and the Health Department. Dishwashers must be professional, helpful, and enthusiastic to excel at this job. Under the general supervision of the Concessions Manager and Concessions Supervisor, Floor Supervisors are responsible for managing the food, employees, and proper sanitation of their areas. The Floor supervisor is responsible for the safety of all guests, employees, and food. Under the general supervision of the Floor Supervisor and Cash Room Clerk, the Hawker is responsible for selling and promoting items for sale while walking throughout the stadium, primarily the seating bowl. They are responsible for the receipt and disbursement of money or legal tender (credit cards, debit cards, gift cards, team cash, coupons or comp cash) during game day at the facility. Under the general supervision of the In-Seat Vendor manager and cash manager, the In-Seat Vendor is responsible for selling and promoting items for sale while walking throughout the stadium, primarily the seating bowl. They are responsible for the receipt and disbursement of money or legal tender (credit cards, debit cards, gift cards, team cash, coupons or comp cash) during game day at the facility. The Kitchen Manager is directly responsible for the cooking and delivery of food for the entire restaurant operation at the facility. This position will be expected to direct a kitchen crew to accomplish responsibilities. This position will require someone with cooking and management skills to be able to provide food for all restaurant venues within a short period of time. This will also require someone with excellent time management and organizational skills. This position will be required to work a varied schedule that will include evenings, nights, and weekends. The Kitchen Manager reports directly to the Director of Operations. Under the general supervision of the shift lead and concession manager, the prep cook is responsible for preparing food and assisting in the preparation of items during the event. The cook should understand the proper cooking and holding procedures to not sacrifice quality or freshness of product. Under the general supervision of the Concessions Manager, Concessions Supervisor, Floor Supervisor and the Production Supervisor, the Production Lead is responsible for managing the food, employees, and proper sanitation of their areas. The Production Lead is responsible for the safety of all guests, employees, and food. Under the general supervision of the Concessions Manager, Concessions Supervisor and Floor Supervisor, the Production Supervisor is responsible for managing the food, employees, and proper sanitation of their areas. The Production Supervisor is responsible for the safety of all guests, employees, and food. Under the general supervision of the stand manager, the runner is responsible for preparing food and assisting in the delivery of food for a specific order without sacrificing quality and presentation of food. The Concessions Manager is responsible for the overall organization, sanitation, and stocking levels of all concession stands and portable stands at the Leidos Field at Ripken Stadium. He/She is directly responsible for maintaining proper inventory levels, product ordering, and equipment maintenance for the food service operation prior to and during events. Additionally, this person will schedule and direct part-time hourly employees, non-profit groups, and warehouse staff during game day operations. The Concessions Manager will directly report to the Director of Food and Beverage. This will be a full-time seasonal paid position, starting on May 1st and running through the end of the baseball season in September. This person will be required to work a full-time flexible schedule that includes office hours, all home games (38 games), and any other catering events held at the ballpark. This schedule varies and includes nights, weekends, and holidays. The Sous Chef works with the Executive Chef and is directly responsible for the cooking and delivery of food for the entire catering operation at Leidos Field at Ripken Stadium. The catering operation consists of luxury suites with a full-scale menu and several large picnic venues catering to groups of varying sizes. There is one full-scale kitchen to service these areas. This position will be expected to direct a kitchen crew of 8-10 people, and will require someone with cooking and management skills to be able to provide food for all catering venues within a short period of time. This position will also require someone with excellent time management and organizational skills. The Sous Chef reports directly to the Executive Chef. Under the general supervision of the Catering Manager, suite operators provide positively outrageous guest service to patrons at the suite level during all events at the facility. They will assist with suite set-up, inventory management, responsible for taking and fulfilling guest orders and cleanup at the conclusion of the event. As one of the front-line guest service employees, suite operators must be professional, helpful, and enthusiastic to excel at this job. Under the general supervision of the Concessions Manager and Concessions Supervisor, Stand Supervisors are responsible for managing the food, employees, and proper sanitation of their areas. The supervisor is responsible for the safety of all guests, employees, and food. Under the general supervision of the Premium Manager, suite attendants provide positively outrageous guest service to patrons at the suite level during all events at the facility. They will assist with suite set-up, inventory management, responsible for taking and fulfilling guest orders and cleanup at the conclusion of the event. As one of the front-line guest service employees, suite attendants must be professional, helpful, and enthusiastic to excel at this job. Do you love helping people? Do you love baseball? If you answered yes to both questions, you are the ideal Fan Host! IronBirds Fan Hosts are the most important position in the organization, the true doers and front-of-house superstars. Fan Hosts fill roles like ushers, ticket takers, bag checkers, premium hospitality attendants, Kids Zone supervisors, jersey auction promoters, and so much more. If you think that your love of helping people, being social, and enjoying a ballgame is right for the IronBirds, we want to talk to you! WHAT YOU'LL BE DOING Tickets, remember, it's tickets. You'd be a full-time salesperson making face-to-face sales calls to corporate executives. The position will be selling corporate ticket packages including season seat memberships, luxury SkyBoxes, mini-plans and group events and outings. We don't expect that you'll know how to sell our different ticket packages, so we provide extensive training. We'll teach you how to make an appointment with the decision maker and how to help select the best ticket package for their company. Do you remember Willy Wonka and his golden ticket? That golden ticket offered one winner, just one winner, the opportunity of a lifetime; the chance to meet Willy Wonka and tour his famous chocolate factory. The Aberdeen IronBirds, owned by baseball's Iron Man, Cal Ripken, Jr., are offering you the chance to find your golden ticket, the opportunity of your lifetime. THE IRONBIRDS ARE LOOKING FOR A TICKET SALES ASSOCIATE AND YOU JUST MIGHT BE THE SUPERSTAR THAT FITS THE BILL. The IronBirds' Ticket Sales Associate will focus all of his or her energy on tickets. Tickets are the lifeblood of our business and we're giving you the keys to our car. The Ticket Sales Associate will focus their attention selling mini-plans and packages as part of the best ticket sales staff in Minor League Baseball.